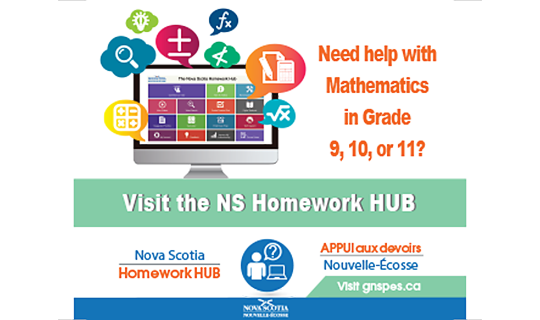 The Nova Scotia Mathematics Homework Hub is a wonderful opportunity for students in Grades 9, 10, and 11 to access Mathematics support in both English and French. Tutors are available, either online or by telephone, for students in any Mathematics course in Grade 9, 10, and 11 (see the posters). Students can access the Mathematics Tutors Sunday – Thursday from 5:30 pm – 9:30 pm. During January 24th – 30th, there are extended hours: 5:00 pm – 10:00 pm. For more information, in English, click here. For more information, in French, click here.